Backed up against a steep hillside that extends up Peak 10, in the Warriors Mark neighborhood is a man-made plateau of simple condos. Most of these are known as Now Colorado, but the middle building contains the Mark 9 condos for sale or Mark IX. Two-thirds of this complex is fractional ownership. All of these three-story buildings are finished in a board and batten style and have external stairs connecting the buildings and leading to the upper floors. They share a large parking area where all residents have available surface parking. Learn more about these homes or start by browsing the Mark 9 condominium listings directly below. The simple two-bedroom units are examples of efficient use of space. The entry hallway is designed to hang coats and skis and lead to an open kitchen, dining and living area that makes use of one side of the single level floor plan, with the bedrooms on the other. 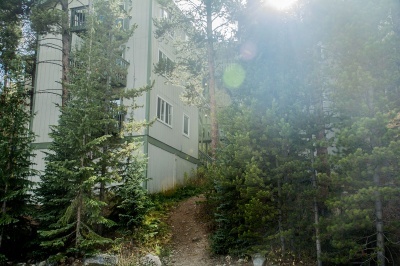 There are no neighbors but the trees on the hillside to the west, and many Mark IX condos for sale will have good view of Baldy and Red Mountain. Amenities: inexpensive, efficient floor plan, parking, close to trails, near bus route, is walkable to or from downtown. From the southern stoplight in Breckenridge, turn west into Warriors Mark on Broken Lance Drive. Follow Broken Lance until the stop sign where the road meets White Cloud Drive. Turn right to stay on Broken Lance and take the 1st left onto Now Colorado Court, 0090 Now Colorado Ct is the address for Mark IX. Send us a message online to talk to an expert from the Breckenridge Associates team about your real estate opportunities in Summit County.